No, I’m not a professional dog groomer, nor do I play one on TV. I do, however, bathe, groom, and clip Dexter at home. This article is to share with you my techniques and what has worked for my dog grooming at home. If you are looking for a more professional look, I would highly recommend taking your dog to your local groomer or even taking a few pet grooming courses yourself. If you don’t have a groomer you love, ask your friends for recommendations. It depends. That’s a great answer to almost any question. But it really does. If you are using a natural dog shampoo that is free of harsh chemicals and preservatives, you can feel comfortable bathing your dog as often as needed. For Dexter, during allergy season, he tends to get a bath every two weeks. During the off-season, it’s more like every three to four weeks. Ideally, this would be daily! Brushing and combing your dog daily will not only assist in keeping your dog’s coat tangle-free, but it is also a great way to examine your dog. Dog grooming isn’t just about getting a clean and shiny dog; it’s also a way to bond with your dog and check him over for lumps and bumps. If you brush your dog daily, you are unlikely to have any tangles or mats to deal with. If your dog is uncomfortable being brushed or touched, read my article Stress-Free Dog Brushing. When brushing your dog, it’s important to go slowly and to be gentle. You can talk to your dog and even give your dog a healthy treat during the process. You want grooming to be enjoyable for both you and your dog. When I brush Dexter, I start at the top of his head and work my way down. I typically rotate between a steel dog grooming comb and a slicker brush. The first big part for Dexter is his big, fluffy ears. It’s important for long-haired dogs like Dexter to get every nook and cranny so that they do not develop mats. I gently lift Dexter’s ears up as I comb underneath his ears. If I do find a snaggle, then I hold the mat at the base and start at the end and work my way up to the base. After working the underside of his ears, I do the outside of his ears. I do this the same way, from the top down, unless there is a mat or tangle. Next, I work my way from under his neck and chest area. After his chest, I ask Dexter to lie down and roll over to his side. I then proceed to brush under his armpits, belly, legs, side and hips. When manipulating his legs to brush under them, I am careful to make sure I am gently moving his legs in a natural fashion. Some dogs, such as the Cavalier King Charles Spaniel, have what are referred to as slippers on their feet. Some people call them Grinch feet. The breed standard suggests keeping the Cavalier’s slippers intact on top. However, it’s important to keep the underside of a dog’s foot clean and fur-free. 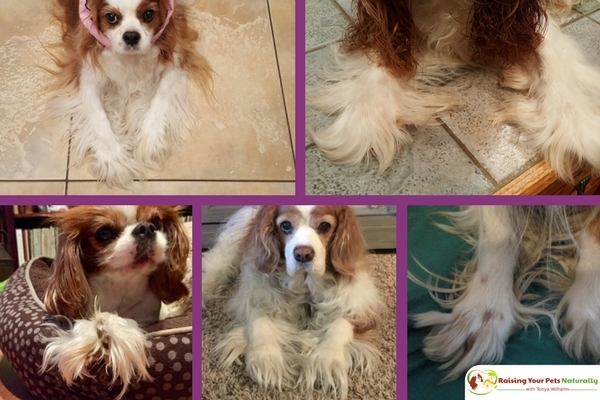 This excess hair can actually knot up inside the paw pads and cause slipping and injury. I do not follow show standards, and I do trim the top of Dexter’s feet, too. He’s a pretty active boy and his furry feet act as sponges! If you decide to keep the tops of your dog’s feet furry, it’s important to brush the fur between the pads regularly, so they do not develop mats. Simply place your finger in between the toes and bring the fur upward to comb. For Dexter, I ask him to lie down and flip him to one side. I then gently pick up one foot as I take the clippers and move the edge of the clipper inside the toe pad and scoop the fur out. Be careful not to dig too deep with the clippers; you don’t want to cause a burn or rash. 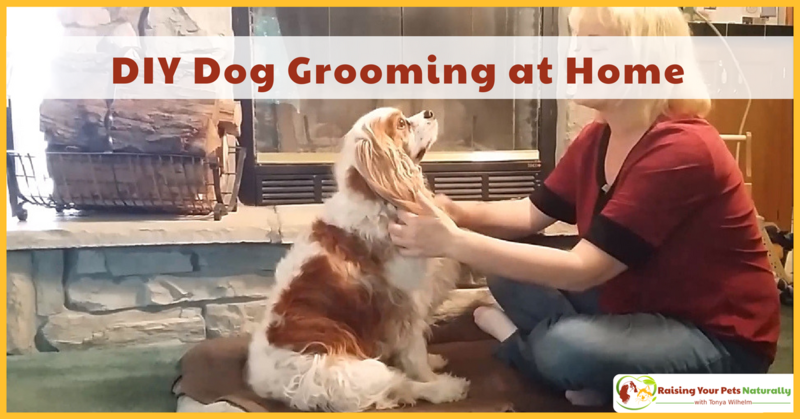 Do You Groom Your Dog at Home? Tell me in the comments. I began grooming my dogs when I had my first springer. When she reached 12yo, I just felt the groomer didn’t have patience for her. She was arthritic and couldn’t stand for long periods of time. I went to another groomer and found the same thing. Then I found a groomer at a vet’s office that seemed to be working nicely. Then one day, I heard the vets talking about vaccinating a dog and I just got the feeling that they were talking about Brandi. I was so upset that I pulled her out and took her home and learned how to groom her myself. Best thing I ever did. It’s a wonderful way to bond with my girls and I know they’re being cared for the way I would like them to be treated. I’ve purchased clippers to trim the bottom side of my dogs feet. I am concerned about accidentally cutting him. Are they pretty safe? 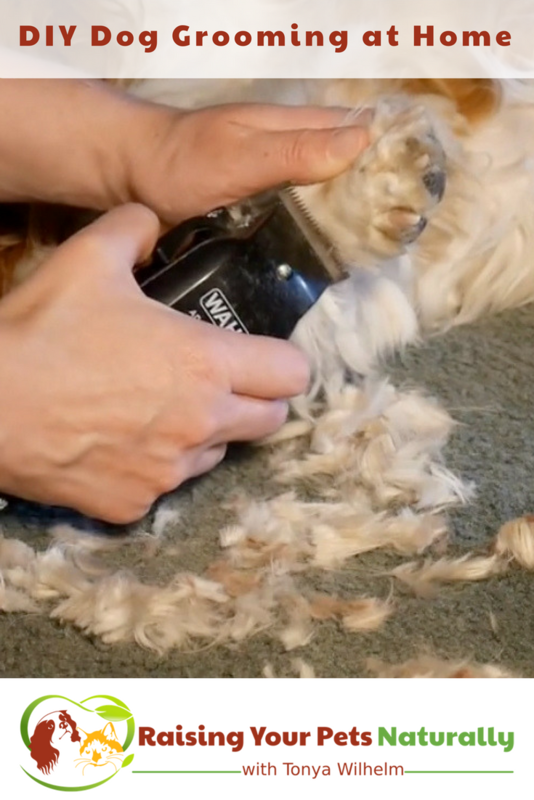 Well, dog grooming is essential to keep the pup’s coat in top condition. Of course, it’s a vital part of pet care. I think many pet owners are familiar with the preliminary dog grooming techniques like- brushing the coat, washing, nail trimming, hair removal etc. I would like to tell that regular grooming helps to stimulate lymphatic system of your pooch, improves the overall condition of his skin and coat, increases the blood circulation, removes dead hair, and keeps your dog looking prettier. This is such a pet care task, which you can do either on your own or with the help of professional. If you prefer to groom your dog by yourself, then you must consider the above grooming tips. Else, you can do the same task simply by appointing a professional dog groomer. I have been grooming my poodles for about 22 years. 3 have gone over the rainbow bridge and all have been treated the same. 1 of the remaining has been trained with Dexter to be a therapy dog and he is still working his charms. Essentially they have to be groomed at least once a month to keep their good looks. Fortunately, I am a licensed cosmetologist so maybe it was a little easier for me. All my poodles have been taught to lay on their backs for me to trim their belly and bottoms of their feet. I do have a groomer that I use 2-3 times a year because I’m getting up in years and I do the dogs outside so weather doesn’t always cooperate. Because of this close exposure I have avoided skin conditions early on. Really appreciate my four-legged friends.